In this blog series, we are covering the damage that Springtime storms can do to residential and commercial roofs. Nashville’s location, where the Great Plains meet the Appalachian Mountains puts in in the perfect spot to get hit by numerous spring storms. These storms are notorious for their strength and violence. They often contain hail, rain, tornadoes and strong winds. In this week’s blog, we’ll look at tornadoes and hail as potential causes of severe damage to your roof. We are Tim Leeper Roofing. We are Nashville’s Top Rated Local® roofer, and we offera number of residential and commercial roofing services in the Nashville, Old Hickory, Goodlettsville, and Hendersonville area. These services include inspections, repairs and roof replacements. 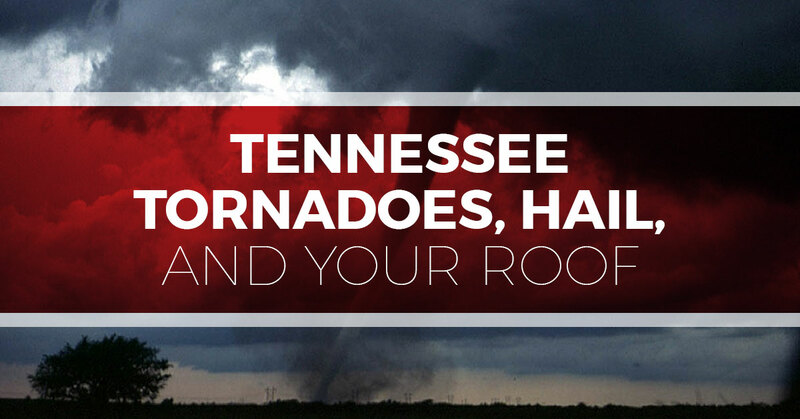 According to NOAA, Tennessee can expect to get up to 6 tornadoes a year. While this might be a lower number than Kansas, where they can expect up to 78 tornadoes, the tornadoes further east can, in fact, cause a higher percentage of fatalities because of a couple of factors. Night time storms and wooded areas that cause limited visibility are two reasons that Tennessee tornadoes need to be taken seriously, even if the number of them doesn’t seem that bad. If a tornado passes close to your home and you escape severe damage, you may still have a claim for roof damage. The high winds of a tornado can cause damage to houses far away from the actual funnel. Flying debris can puncture your roof, and the force of the wind can pull off shingles, flashing, and even whole corners of the roof. Tim Leeper Roofing can repair your roof damage including missing asphalt shingles and flashing. If you need deeper, more structural repairs to your roof, we can handle those too. We do free inspections so if your home has stood up to a severe storm, call us and we’ll come out and make sure you don’t need repairs. We all know the excitement of a hail storm. Hail is an amazing natural phenomenon, and it’s fun to compare hailstone sizes with neighbors and friends. Hail storms make great social media posts, but what they are not good for is your roof. Hail stones develop in storm clouds known as cumulonimbus, or thunderheads. An ice crystal is tossed around as it travels up and down in the cloud and as it is churned, it grows bigger and bigger before, with the help of a downdraft, it descends to Earth and your home and car. Sometimes hair grows to the size of baseballs or softballs before it falls. When this happens, there will be no doubt that your roof has been damaged. On occasion, this extremely large hail can come through the roof and inner floors of the home. Call Tim Leeper immediately if you’ve been hit with very large hail. Large hail stones hit your roof and knock the granules off your asphalt shingles, damaging them. The bruising, as it’s known in the roofing business, can often be seen from the ground, but is best evaluated by a roofing specialist who knows how to tell how big the hail stones were and how widespread the damage is. Tim Leeper Roofing was founded for the express purpose of treating our customers right. Old fashion respect and great customer service make our roofing company the one to choose when you need roofing services.We work on both residential and commercial roofs and are experienced with every roofing material there is. We use the best products to ensure our customers are getting the best. The asphalt shingles we use are Owens Corning Duration with SureNail Technology and all our laborers are experienced and dedicated to providing the best roofing services in the Nashville area.